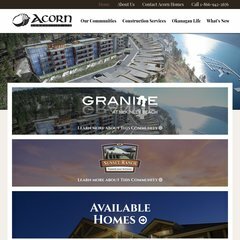 Topics: Construction Services, What's New, Okanagan Life, and Okanagan. acornhomes.com Kelowna Golf Course Community Sunset Ranch Lofts West Avenue Black ..
acornhomes.com Black Mountain Kelowna Homes Community for Sale Golf Course Houses ..
acornhomes.com Okanagan Kelowna Homes for Sale Sunset Ranch West Avenue .. It has 2 DNS records, ns1.navigatorbizhost.com, and ns2.navigatorbizhost.com. It is hosted by Iweb Dedicated Hd (Quebec, Montreal,) using Apache/2 web server. It is written for PHP/4.3.10 language. PING (209.172.33.199) 56(84) bytes of data.